This book is unique. Here's what sets it apart. The book's most important messages. When Your Child Has An Eating Disorder: A Step-by-Step Workbook for Parents and Other Caregivers is a must-read for every parent whose child may be dealing with an eating disorder, or is susceptible to developing one. Do any of the following scenarios describe you? Your child has an eating disorder and you have not yet mustered up the courage to tell her she needs help. You do not know how to confront her and what to say. You are afraid that she will resist your efforts to help her or that she will respond angrily. You fear that her behaviors will become more entrenched for recognizing them openly. She may not know that what she is doing to herself is harmful, she may not be willing to let go of the behaviors, or may remain secretive about her behaviors. Your child has an eating disorder and is convinced she is capable of handling it herself. She believes she is in control of herself and her eating and can will herself to make changes when she is ready. She does not recognize that she is in the death grip of a lethal disease. In the meantime, your child hardly eats, she is dropping pounds rapidly, or becomes fiercely angry if you implore her to stop hurting herself and to eat more. You believe that you are the cause of your child’s eating disorder. You are afraid that addressing the problem directly could make matters worse. You assume that you have made too many mistakes, despite your good intentions. Perhaps you were too controlling with her, resulting in her becoming overly controlled with herself. Perhaps you were not controlling enough, resulting in her feeling overly powerful and needing the eating disorder to assume an iron grip of self-control so she can feel safely grounded. You think there is nothing you can do. You don’t know what to say to your child, and you wish you did. You feel the need to educate yourself about these diseases and then to educate your child about the danger she is in. You need to help her find better ways to resolve the emotional problems that underlie the dysfunctional eating or exercise behaviors you see. Your eating disordered child may already be involved in a therapy/treatment process which appears to be non-productive. The professional team your child is using may not be expert or knowledgeable enough about the unique aspects of this treatment specialty. Your child’s therapist may be under the all too common misconception that by simply addressing the “other issues” that underlie the eating disorder, the disordered behaviors will eventually heal themselves and vanish. You wonder if your child is in the best professional hands, and if so, what to do in response. Noticing that despite your child’s having been in treatment for her eating disorder, the disorder is not going away, you wonder whether it may be time to intervene to bring about positive changes. Might YOU have an eating disorder, too? This book helps adults afflicted with eating disorders to understand what they are going through, both as people and as parents, and to learn what to do to come through the experience a complete and whole person. This book is inspirational and motivating, providing the guidance, support and reassurance patients of all ages need to gain the wherewithal to fight this disease and come out the victor. It is not uncommon for women in their thirties, forties, and fifties to admit that they have struggled with their disorder for decades. Accomplished professionals, mothers and wives, and they gone underground with problems, dodging children whom they do not want to influence negatively, and husbands who they do not want to shock or disgust. They may have lived under the misconception that people simply grow out of eating disorders. Many do not come to treatment; those who do, come feeling defeated, futile, discouraged and fearful. Here is a book full of solutions for them. Are you a health professional or educator? Health professionals and educators, too, have a great deal to learn from this resource. If you are a doctor, psychotherapist, nutritionist, nurse, or patient educator, you may find yourself feeling the need to refer these cases out of your practice, assuming you are ill-equipped to deal with this specialty. 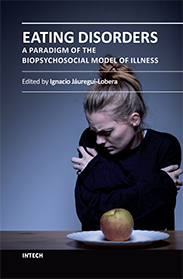 This book offers a unique “insiders” look at the illness, at unique treatment requirements, and at the unique role of the professional team and the family players in the child’s experience of going through and beyond sickness to become well. Health professionals are encouraged to use the upwards of 50 exercises and activities provided in this workbook as a springboard for discussion, personal insights and self-awareness in groups and individual psychotherapy sessions. Teachers, coaches, and school guidance counselors learn to recognize signs of eating disorders, as well as of incipient disease, and to address these issues directly with students and parents. As agents of prevention, diagnosis and cure, schools become potent advocates for students and families in helping them find effective community-based recovery resources, in improving life quality and the capacity to learn. In some cases, these “lessons” can save lives. Here is what sets it apart. This book is about hope. This book provides a way out if you are feeling trapped in fear and confusion… it offers optimistic solutions and hope, reassurance and wisdom, tools and resources, and best of all, the permission we all need to be human… to be imperfect…and yet to prevail. Between its covers lies a “virtual” psychotherapy experience. This book is an essential companion to the psychotherapy process. Psychotherapy is about learning and making changes; it is about self-awareness, relationships and freedom to make choices and take action. This book augments, facilitates and streamlines that process. Parents and patients cannot afford not to read this book. The book helps you assess whether your child’s therapy and treatment program is as effective as it can be. It teaches you how best to support your child throughout the treatment process. What feels supportive to your child will change throughout the therapy process; The nature of your support will need to change throughout your child’s treatment to accommodate the changing needs of your developing child. The book teaches parents what they are doing right. Through the process of your child’s recovery, you will find yourself growing and learning, both as a parent and as a person, in tandem with your maturing child. You will ultimately learn to become a better parent to your child. This book could save your child’s life. Eating disorders are the most lethal of all the mental health disorders; 87 percent of those afflicted are children under the age of 20. By guiding you to tend to your child’s needs, this book will be instrumental in improving the life quality of your entire family. Through recovery, children claim to “have their life (and personality) back.” Parents claim to “get their child back,” making connections that are healthy and that are lasting. 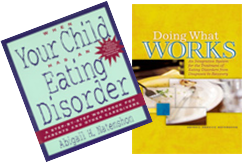 When Your Child Has an Eating Disorder: a Step-by-Step Workbook for Parents and Other Caregivers is a workbook. It is filled with over 50 exercises and activities for readers and their families to try in the interest of learning more about themselves, their child, this disease, and and how to overcome it. The written exercises personalize the workbook for each parent, tailoring awareness and insights to the personal needs of each reader and child. This book says it all. The information in this book answers all of your questions…including those you may not yet have been able to formulate. It will accommodate your own and your child’s needs, no matter what point she may be at in the diagnostic, treatment and recovery processes. Open this book to any page to find information pertinent to your own and your child’s needs and condition. A second read-through after your child has become more substantively involved in the process will add layers of more profound levels of understanding and meaning. Parents confronting an eating disorder in their child need not feel lost or frightened. Eating disorders are difficult diseases to detect and to understand. Even more perplexing is how to respond to them and to your afflicted child. It may feel as though your child has become “lost” to you, that you don’t know her anymore, that she has been taken hostage by the dictates of an eating disorder. What starts out as benign enough quirks or habits around eating can turn into a dangerous and lethal dysfunction that impairs a child’s capacity to learn, to interact with others, and to mature healthfully. Shed your guilt to help your child heal. As a parent, it’s easy to feel that whatever bad happens to your child is a result of your having done something wrong. Parents are not to blame for their child having an eating disorder. There is a lot they can do, however, to heal their child once afflicted, or even to prevent an eating disorder that may be developing. Rectify the problem, NOW, and for the future. You’ve heard that eating disorders cannot be cured, that “once anorexic, always anorexic,” don’t believe it. Take charge in an intelligent and appropriate way until such time as the child is capable of resuming self-care through self-regulation and self-control. When parents learn how to respond and leave no stone unturned, when help is optimal and support is forthcoming, eating disorders are completely curable in 80 percent of cases. The sooner you define the problem, the sooner you will be able to find lasting solutions. Early problem recognition and sensitive and knowledgeable parental participation in recovery are two of the most significant factors in achieving a timely and sustained recovery. Reconnect with your child to help heal your child. Eating disorder recovery relies principally on the health and stability of the parent/child connection. The nature and quality of your relationship with your child now can be instrumental in saving his/her life. In addition, when parents hone their parenting skills in helping their child recover, they are investing in the quality of their relationship with their child for the rest of their lives together. Establish a strong connection with your child. Be a parent to your child, not a friend. Being the parent your child needs you to be regarding her eating disorder could save her life. Re-discover and follow your instincts about how to behave, what to do. Recognize what you are doing right, and keep on doing it. Know what more you need to learn in order to parent your child most effectively. Be expertly guided in your actions by the incomparable resource, When Your Child Has an Eating Disorder: A Step-by-Step Workbook for Parents and Other Caregivers. This book outlines all you need to know to become the parent your eating disordered child needs in her efforts to recover; it answers your questions, leading you step-by-step through what is typically an extended and convoluted process. It covers such topics as recognizing disease, confronting your child, finding the best professional help and learning how to support your child optimally in her efforts to heal. Learn how to choose your child’s professionals carefully. Learn to trust your instincts about the quality of your child’s professional care. Not every therapist or doctor is emotionally or professionally equipped to handle your child’s care expertly. Inexperienced professionals may not recognize the power of an informed and committed parent to heal a suffering child and may not know how to access this powerful recovery resource. Do not be excluded from your child’s eating disorder recovery, or randomly denied access to a process that is unfolding before your eyes every day. It is up to you to see the writing on the wall and to take action. Living side by side with your child and with this disorder, you need to become more than a passive bystander. Informed parents play many roles; they are diagnosticians, limit setters and confidants. They are child advocates and they are, in some cases, as responsible for facilitating the child’s day to day tasks of recovery as is therapist or physician. Your child will consider you an ally, not an adversary. Your child needs you now more than ever. On some level, your child knows that the disease that she sees as sustaining her life, also denies it. Despite his or her apparent resistance and protestations, your child will welcome your intelligent and informed input. The eating disorder is a “monkey on your child’s back,” depriving her of self, and the freedom and capacity to learn and solve problems effectively. It prevents effective self-regulation and self-care. It interrupts the process of normal development into an emotionally effective adulthood. It is what stands between your child and happiness. Your child’s health professionals should be your allies. Too many therapists are of the mind that parents are the cause of their child’s eating disorder and that therefore, the therapy process “belongs” to the child alone. They view parental involvement as interference depriving the child of independence and autonomy. Some professionals do not understand that the eating disorder exists within the family system, and does not just belong to the child afflicted. Facilitating your child’s recovery, at home and through family treatment, is NOT the same as interfering with your child’s treatment. Misguided professionals believe that they would violate their child’s privacy and the confidentiality of the therapy sessions by coaching or guiding parents. Do not be taken in by this misconception. Therapists spend 45 minutes a week with the patient; parents live alongside their child 24/7.Parents and siblings who exist side by side with the disorder also need to learn to live productively alongside its recovery. In hiring your child’s professionals, seek positive changes in your child that will reverberate throughout the entire family system. Seek until you find….